An Update for TiVo Premiere! 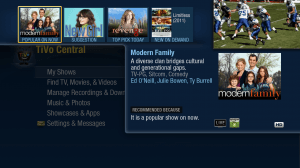 Home » An Update for TiVo Premiere! We are pleased to announce the release of version 20.2 for TiVo Premiere, TiVo Premiere XL, and TiVo Premiere Elite. Some of you may have already received the update on your TiVo Premiere box, but if not, you will automatically receive the update by the end of the month. We’ve made significant changes to our HD menus to make them smoother and faster – but the most exciting news is the conversion of our video watching and Guide experience into HD, along with the addition of Premiere-to-Premiere Multi-Room Streaming. 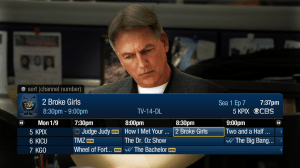 Whether you prefer the traditional Grid Guide or the TiVo Live Guide, both are now updated to take advantage of your HDTV. The Guides display the live or recorded show you’re watching in the corner, instead of in the background. The Guides have icons to show what is currently recording, and what will be recorded. A “new” icon appears next to new episodes, and you can now see the season and episode number and first aired date. You can even sort by channel name if you want to quickly find “CNN” or “USA” and you don’t remember their channel numbers. If you’d rather scan through the Guide three channels at a time, try the new Mini Guide. Press SELECT when you’re watching live TV or a recording to make it appear. Move around the Mini Guide using the arrow keys or channel up and channel down, then press ZOOM or CLEAR to dismiss it. 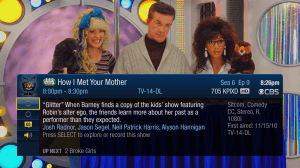 There’s a new look for the Info Banners that display information about the show or movie you are watching. When you first enter Live TV, you’ll see the standard size Info Banner. It has information about the show, what’s up next on the channel, and how much of the current show is saved – in case you want to rewind. 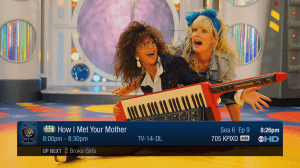 When you channel surf in live TV, you’ll see the standard size Info Banner, which will show you what’s on now, and what’s up next. Any time you want more information, press the INFO button to see the full size Info Banner. When you start playing back a recording from My Shows, the Info Banner includes the TiVo Status Bar. If you have two TiVo Premiere boxes on the same home network, you now have the option to “Play” the show from one Premiere on the other Premiere. 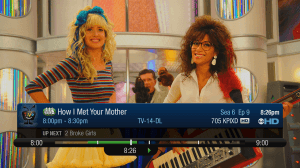 You no longer need to transfer the show – it will stream. If you have recordings from channels that do not allow transfers, you should now be able to stream them instead. Multi-Room Streaming of HD shows is not recommended on wireless networks. Wired Ethernet will provide a much better experience. Once you’ve watched the show, you can remotely delete it off of the TiVo Premiere that recorded it. The Discovery Bar gives you a quick way to watch or schedule a show that interests you. We’ve made several changes to the Discovery Bar with this update. We now only show four items in the Bar if the Video Window is on, or six items if the Video Window is turned off. The Bar no longer scrolls, but each time you visit a new screen you’ll continue to see new Discovery Bar items. You can also see at a glance why an item is in the Bar. Each item has a label below the image. If you want to change which items appear in your Discovery Bar, go to Settings > Displays > Customize Discovery Bar. (in addition to Amazon Instant Video, Netflix, and Blockbuster). -You can search for a Channel by name, like “MTV” or “Lifetime”. -If you don’t find what you’re looking for, you can create a WishList search based on what you have already typed in. The update will be available on all TiVo Premiere boxes (purchased from tivo.com or a retailer) by the end of the month. 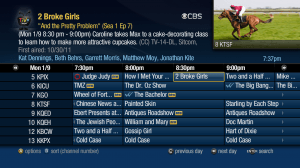 TiVo Premiere boxes provided by cable companies will be updated this Spring. 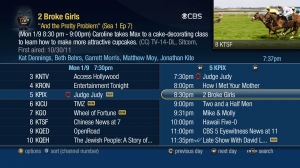 We’re very excited to start 2012 with this update for TiVo Premiere. We look forward to bringing more updates throughout the year! New Netflix app and OnDemand – two things that can’t hit my TiVo fast enough! Would be great to have xfinity on demand for the premiere. The new interface is awesome! I’ve had it for a week or so, and it is much improved over the previous interface. There are more subtle changes that aren’t listed above that make the screens easier to read. I do have some wish liist items for TiVo, I hope you are considering adding these as well. 1. 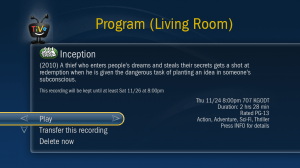 Streaming recordings to devices on your home network other than another TiVo Premiere. For example, I’d like to be able to stream to my Vizio TV in another room. 2. Ability to stream SiriusXM internet radio. 3. Windows PC app for controlling TiVos, similar to the iPad or Android app. Any chance for trickle-down to Series 3/HD boxes? Being able to search across Hulu (in addition to Netflix and Amazon) is great. It’s nice to have it all integrated. Will our Hulu queue also appear under My Shows? And will we be able to set up Season Passes for Comcast On Demand titles? It would be great to have one place to look for all my new episodes, regardless of source (DVR or streaming). This would be most useful for sources like Hulu and Comcast where new episodes are added weekly. I’m not sure I want my entire Netflix queue under My Shows, however. Maybe only partially-watched Netflix titles should be listed under My Shows. Daniel, check out KMTTG for number 3. It is a combination of TiVo Desktop and the iPad app. It isn’t as pretty as the iPad app, but it includes most of the functionality and more. Hopefully they one day update TiVo Desktop so it matches the HDUI and adds all the features the iPad app has. I do agree about the update. I am definitely liking the update and can’t wait to see what other new features come in 2012. It sure would be nice if you enabled Netflix and YouTube for your Canadian customers. It’s not fair that we are left out! Very cool. Good to see the ducks lining up! Why TiVo does not implement an option to allow us to easily find conflicts? It is a pain to have to go to the To Do to find it every week. I really can’t understand why something that simple can’t be done. After test driving this update for a while, I found I had to return to using the SD menus to get away from the annoying lag in the HD screens. Having been a Tivo user since Series 1, I have grown used to get a near-instant response when I press a remote button, and the slight delay in HD is a giant step backwards. I would, however, happily put up with delay in HD if only there was a way to turn off the HORRIBLE Discovery Bar. That real estate should be used for displaying useful information rather than giant ads for things I don’t care about. Give me a larger list of my recorded shows so I don’t have to page through so many screens (and get the spinning green circle over and over). The Premiere has been a major disappointment from the day it was relesaed. My biggest regret is that I sold my S3 before fully realized just how bad the Premiere was. This is quite possible the WORST major software “update” I have seen since the days of Windows ME. The Guide has lost the elegant transparency and now looks VERY dated. None of the Settings menus are in HD. Every screen transition is glitchy at best. Oh, and the update completely eff’d up the clock – manual updates have no affect and there is no configuration setting for this that I can see… The only real advantage TiVo had left over the service providers was software. No more. Note to TiVo: FIRE your user experience people. I just updated both of my Premiere boxes. Love the new HD menus but I’m not getting the “Play” option. Both of my boxes are on the same network. this is really a major update? these features should have been available when this was released. i will not be renewing my contract after it expires. I’m extremely disappointed. The guide is still unbelievably slow and the transitions take longer than apps do on my phone. This is awful. Just got the update last night. At first glance, the guide updates appear to be good, but I’m not blown away by them. Haven’t tried the mini-guide yet.. might be cool, but not something I thought I needed (would much rather have seen improvements in the menus that are STILL the original SD Tivo screens w/o the HD PIP interface). I’m not a big fan of the info bar changes. You’ve basically made it look like every other DVR’s info bar and therefore it has lost some of it’s Tivo uniqueness. I don’t like it at the bottom of the screen. I always liked how Tivo put it at the top – I found this more appealing for some reason. I also liked the fact that I could easily change the size of it (i.e. to show all info, less info, or a very small oval in the corner with very basic info). Now I’m stuck with it always taking up the bottom 1/3 of my screen. The only thing I like about it is being able to see what is playing/recording on the other tuner. As for the Discover Bar – who cares? I totally agree with KP! How do I filter the new guide for Movies > Documentaries? It was simple in the SD guide. It is nice to see that you guys are still innovating. I would like my TiVo HD to do more so I need fewer devices hooked up to my TV. I find the Netflix interface to be pretty bad (I don;t want to have to add to the instant queue first) and YouTube is worse. And you really need to support Amazon Prime Instant. Do all that I will be very happy. Will we get any of this on the HD or is it all Premiere only? The Premiere was introduced a month after I bought my HD. I would probably consider upgrading if you had a way to migrate season passes and recordings. Love it, looks a lot cleaner. Just wish you had Cox On Demand and while I am at it what about Fios to for those that have Fios. I know the Tivo HD has a slower processor but wish you had some kind of update. Remove the Search Beta option, it is dog slow. We used to love TiVo so much but this new release and it’s lack of filter capability may return us to cable. We used to be able to apply “baseball or basketball” and know what games were on for the day. While the discover bar attempts that it’s suggestions are frequently wrong, the show that is on now I can see in my guide. Sadly I used to be able to find what I wanted to watch and can no longer do so. It appears you’ve added some nice bells and whistles but traded functionality for it. Is there hope for a return of the filter? Pause on live tv only stays on for a few seconds!!! How can I get my less-intrusive little channel banners back? New banners are too big and intrusive on top of the show. Mine just pulled the update. Looks very nice. Love the mini-guide. Keep working! Only 90% of the SD menus left to go! Agreed. New netflix app is a must! This old one doesn’t allow viewing of TV episodes past 100 or so. We need to be able to sort by season etc! Also, we should be able to search for stuff instead of only a Instant Queue. Hopefully these will be implemented. With the new upgrade, closed captions no longer appear when using the 1xFF. Please return this feature. Add me to the list of people begging for a return of grid guide filters. I used to be able to scroll through my channels with a HD=>Movies filter and see all currently-airing HD movies highlighted within the grid guide. 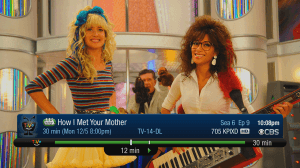 With that feature seemingly removed, TiVo’s a LOT less usable for random movie viewing. Not a fan at all. PLEASE PLEASE PLEASE bring back the grid guide filter! Jeremy – time to retire the Series3 and move to Premier. You won’t regret it. Love the update! I’m not seeing the delays that some people are reporting. Great job! I love the new guide… I see a lot of people are complaining about the slow guide… if you turn the tivo sounds when you click a button the lag is almost completely gone. I turned them off on the old guide and that helped it a lot. Some people just cannot be satisfied. This update is great. I love the new guide and the mini guide. It’s great to have Hulu Plus integrated into Search. I can’t wait to have a new Netflix app. I just wish they would add some new internet apps. I’d really love a weather app. Keep up the good work. I was surprised and confused when our menus just up and changed without notice, and my wife spent an hour trying to figure out what was wrong. How about a bit of notice TiVO when you are going to change the way something looks? Dean, you’re right, a popup message would have been handy. The Tivo displays messages for other things, like channel lineup changes, so I was surprised not to see a message about the software update. Sure would be nice to have ALL menus in HD. To-do listing, season pass manager, etc… I do like the new look, I’m just ready to see a dramatic change in converting SD menus to HD. TiVo clock display (S-P-S-9-S) now displays near the center of the screen in a very small font. Any chance a small update will be coming? I hope the loss of filtering capability is a BUG not a FEATURE and that it will be fixed ASAP. As a software developer, I have learned that one must never, never, take away a well-loved feature when updating a program. Was it a bug that slipped through or are we stuck with the new look and loss of functionality? 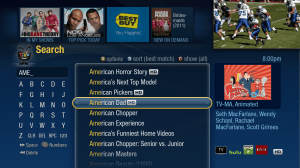 TiVo – As a long loyal fan and customer let me offer a suggestion. On the guide give us the ability to use the red button to set a filter by category. I used the filtering feature and would like it updated and brought back. I was unable to easily locate kids live kids shows this evening because for my son because that feature has been surprisingly removed. I don’t care about filtering by useless channel numbers or channel names. I want to filter by category. I can get to options on the guide with the yellow button and sort by channel name or number using blue. Please give me a filter with the red button or I’ll have to switch service. I’m loving the updates so far. And I look forward to more. I’m suprised there has been no mention of Picture In Picture. Or with the Elite, it would be cool to divide the screen into 4 with a different tuner display in each quadrant. All I know is – ever since this update, my Tivo is stuck in “downloading” mode when trying to update the Program Guide. I think I’m ready to give Tivo the heave-ho. How do we read email or at least have a pop-up that can send/receive TXT messages and Instant Messages with links to YouTube videos or web-pages on the TiVo Premier? Should we just wait for the new “Apple TV 2012” (google)? Your product costs $600 (or $100 plus $240/year), so forgive me for expecting this. Why do I have to have my own server to run HTML/CSS/JS based “Apps and More”? Why doesn’t TiVo have an app-server running tom Amazon EC2 or something with apps for weather, ordering pizzas, etc.. –like Samsung, Sony, etc. Tivo’s Amazon player is download-only, no streaming. Amazon Prime is streaming-only, no downloads. If I wanted to download an Amazon Prime video to my Kindle Fire, I’d have to pay for it. But if I just want to stream the video on my Fire or Roku, then it’s free with my Prime membership. For now, Roku has the better interface for Netflix and Amazon, but I find Hulu a bit more responsive on Tivo compared to my (first-gen) Roku. L, it never occurred to me to send email from my Tivo, or my Roku, or any other gadget hooked to my TV. If I want to send links to videos and web pages, I use a laptop, or maybe a tablet. It’s much easier to type. Please give us back the filter option 🙂 Maybe a “blue” button option on the remote while in banner mode?? Also, please give us the option to select channel linedups easier…right now I manually go through and try each channel and then edit the channel lineup. On the channel selection screen why not add the live view window in the corner and show what would be on each channel to see if we get it? ?